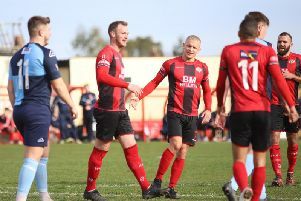 Marcus Law was delighted with a “professional job” as Kettering Town took another giant step towards Evo-Stik League South Premier Division Central title glory. The Poppies had too much for a young St Neots Town side as first-half goals from Rhys Hoenes, from the penalty spot, and Declan Towers secured a routine 2-0 success at Latimer Park. It was the perfect response from Law’s team after last weekend’s 1-0 loss at Biggleswade Town. But the big boost came from a familiar face as Royston Town beat second-placed Stourbridge 3-2 with Tom Knowles, who scored the Poppies’ winner against Stourbridge in their crucial 2-1 victory in January, coming back to haunt the Glassboys again as he struck another late decider in his latest loan stint. It means Law’s team were able to restore an 11-point advantage at the summit with just six games to go. 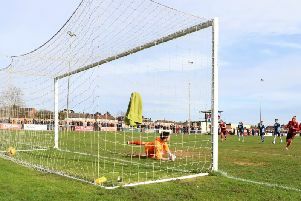 Their next assignment is at Leiston next weekend and Law insists his players will just keep going as they bid to get over the line. “Full credit to St Neots,” he said. “They made a decision about the direction of their club which has been well documented and every single one of their players and their management have done their club proud. “They stuck to their task and worked their socks off and, at times, there was some fantastic goalkeeping and defending to keep the score to what it was. “From our perspective, 2-0 was probably a bit unlucky in the first half because the movement and passing was excellent. “We were always in control and then Dan Holman is unlucky to hit the bar and not get the third early in the second half. “But it was very similar to Banbury the other week, we controlled it and got the job done and it’s turned out to be a very good day for us. “From going into the game needing five wins, we now need three so we need to win half of our matches. “But everyone can see that we are working hard and once again we have responded well to a poor performance and result last week. “It wasn’t emphatic, it was a professional job and there wasn’t much to excite the crowd in the second half. “We have got a difficult, long trip to Leiston next week but we want to get one back on them for what happened here.